Most of us do have a pretty tight budget for our weddings. But we don’t want to give anything on the celebration. Which means we do a lot ourselves. So how do you determine what to do yourself and what to hire? Who should you ask to help? And how can you reduce the stress of doing yourself? Anything that can be done ahead of your wedding day – should be done ahead of time. Even easy things – if it can be done the week before, do it then. A day before – do it then. A wedding day is busy and stressful all by itself. Eliminate everything that can be done before hand so you are relaxed on the big day. Flowers are high labor items so I really recommend outsourcing flowers because of the time they take. I love crafts and thought I would love to do the flowers myself, and actually if it wasn’t right before the wedding, I probably would have. And if you really want to do them yourself, be sure they are done at least a day before the wedding. 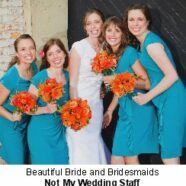 Finally, be realistic about who will be available to assist you on the wedding day. Do not expect your wedding party to do anything to help you for at least five hours before start time. I’ll say it again – Get friends or hire help for set up. With five daughters I figured I would have lots of last minute help, but no, what I had was one bride and four bridesmaids doing their hair and nails!